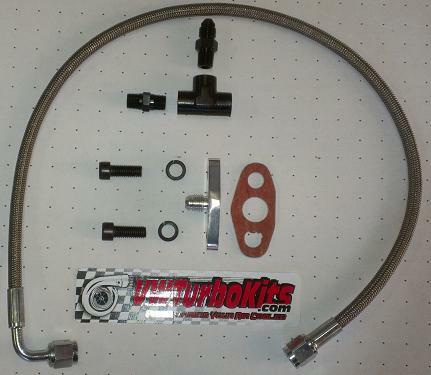 VW air cooled turbo oil line kits. 1x AN -4 fitting to connect stainless line to case. 1x 1/8" union to screw into your stock psi switch location on the case. 1x AN -4 mounting flange to mount on top were oil is feed to turbo. Has built in oil psi restriction as needed. Fits T3 and T4 Turbo's. 1x -8 to npt to mount stock style fuel pump block off to. 1x Fuel pump block off flange to drain back to. your oil in and out of your new turbo to your VW!